13th Octber, Taipei: Malaysia celebrated a superb double when Zulmazran Zulkifli and Sharon Koh emerged as Men's and Ladies' Open Masters champions of the 9th Chinese Taipei International Open which ended Saturday evening. Zulmazran Zulkifli celebrated his Muslim new year in style as the top-seed defeated teammate, Daniel Lim in the all-Malaysian stepladder finals to captured his first title this year. But the 24-year-old had to work hard for his victory when he was stretched into a deciding match. Daniel, who won the second match after ousting third-seed and overnight leader, Purvis Granger and winner of the first match, Wang Tien-Fun of Chinese Taipei, 228-192-216, beat Zulmazran, 205-186 in the first game. But Zulmazran fought back galantly to outclass his compatriot, 247-174 to cap off a superb Hari Raya day and the men's crown. Daniel again finished as runner-up after he lost to Mika Koivuniemi of Finland in the Singapore Open a week ago. Malaysia almost took all the top 3 podium positions but the sixth-seed, Wang Tien-Fu ended their hope after the Taiwanese dispatched fourth-seed, Aaron Kong and fifth-seed, Adrian Ang, 236-226-213 in the closely fought first stepladder match. Zulmazran had earlier topped the second block finals with 3578, 128 pins ahead of Daniel Lim, who finished second with 3450. 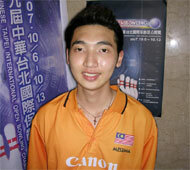 The remaining Malaysian, Alex Liew missed the stepladder just by 6 pins when he ended up in seventh with 3345. Meanwhile, Sharon Koh gave Malaysia a Raya double when the 20-year-old finally nailed her first international title in top flight defeating challenger, Tsai Hsin-Yi of Chinese Taipei, 202-167. 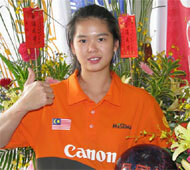 The champion was forced into the title match after she lost to Tsai, 198-211 in the first game. Sharon made up for the disappointment she had when she narrowly lost to compatriot, Zatil Iman in the Singapore Open last week. The runner-up, who finished fifth in the second block finals earlier, ousted Geraldine Ng of Singapore and teammate, Pan Yu-Fen, 226-214-194 in the Ladies' first stepladder match. Lan, 224-164-205 before going down to Sharon. The champion had led from start to finish in the second block with a convincing margin of 225 on a total of 3539. Chan, who almost shot a perfect game with 298 in the final game, snatched second spot from Chien Hsiu-Lan with Geraldine Ng, Tsai Hsin-Yi and Pan Yu-Fen finishing in the top 6 for the stepladder finals. 12th October, Taipei: Ex-PBA bowler, Purvis Granger clinched pole position in the Men's Open Masters first block finals of the 9th Chinese Taipei International Open after a keen tussle for the lead with Malaysia's Daniel Lim. Purvis Granger, who laid off bowling for several months busy travelling around Asia to provide coaching to youths, took over the lead after the second game with just 4 pins but lost it briefly after Malaysia's Daniel Lim posted 278 in the third game. The American fought back with a 264 in the fourth game to regain the lead at the halfway mark while the Malaysian suffered a 188 to trail by 47 pins. Granger hit a low game himself in the fifth but had his lead reduced to just 6 pins after the fifth. Both Granger and Daniel were neck and neck and trading the lead and the final game of the 8-game block, Daniel had a 23 pin lead but it was the cool Granger clinched pole ending with a superb 267 in the eighth game that settled the outcome with 1814. "I had trained hard the week before coming for this championship and it's not easy coming back to compete at such a hot pace," said Granger. "Daniel bowled well except for lanes 9 and 10 where everyone had trouble. I shot a 165 there too. I threw a lot of gutter balls especially having to bowl right on the outside. The Singapore Open runner-up settled for second just 10 pins adrift on 1804 ahead of teammate, Zulmazran Zulkifli third a further 37 pins away. Fellow compatriot, Aaron Kong kept close with the leaders throughout to finish fourth with 1729 while the best Taiwanese finisher was Hsieh Fu-Tai taking fifth spot. Chief coach, Holloway Cheah must have been pleased to see another Malaysian, Adrian Ang in the top 6 when the youngster took sixth position. 12th October, Taipei: Singapore Open first runner-up, Sharon Koh of Malaysiam ended the Ladies' Open Masters first block finals of the 9th Chinese Taipei International Open with a comfortable margin of 156 pins ahead of Singapoere's Geraldine Ng in second and Hong Kong's Chan Shuk Han third. Sharon Koh, the 43rd AMF World Cup bound Malaysian, immediately took the lead after the second game and went on to end the first block by a convincing margin. The 20-year-old, who finished second to compatriot, Zatil Iman in last week's Singapore Open, stepped up on on her form to take pole. The Malaysian knocked down lines of 227, 249, 214, 238, 222, 234, 214 and 229 for a total of 1827 pinfalls over the 8 game finals. Hong Kong's Chan Shuk Han, who was trailing Sharon most of the way, finished third to the strong finishing Geraldine Ng of Singapore in second. 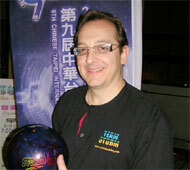 The top overseas qualifier amassed a total of 1671 to finished 35 pins ahead of Chan, who totaled 1638 for third spot. Defending champion, Chien Hsiu-Lan at one stage was second to Sharon, took fifth place with 1632, just 3 pins behind compatriot, Pan Yu-Fen in fourth with 1635. Taiwan's season campaigner, Chou Miao-Ling did well to finish sixth with 1606 followed by Tsai Hsin-Yi in seventh with 1603. The top 7 averaged above the 200-mark in this 8 game block. Newly-crowned Youth Masters champion, Christyn Chew had a bad start and never got into her stride ending up 29th in a field of 34 ladies. The men will take to the lanes for their first block later and the ladies will continue their second block tomorrow morning. The top 6 at the end of the two blocks will make the stepladder finals. Photos by Sidney Tung, MTBC. 11th October, Taipei: Malaysian National youth, Christyn Chew bagged her first international title after she outclassed a strong field to emerge champion in the Youth Masters finals of the 9th Chinese Taipei International Open. Christyn posted 221, 184, 231 and 202 in her first 4 games to stay amongst the leaders in the top 3 after Gregory Gan of Singapore and another Malaysian Johnathan Chan tussling over the lead. Johnathan led after an amazing 280 in his fourth game but could not maintained the pace. Christyn then picked up her pace knocking down 258 and 279 in her fifth and sixth games to take over lead. The 19-year-old continued with 196, 225, 259 and 215 to total 2330 including 60 pins handicap. Gregory Gan, who was 53 pins behind Christyn before the final game, came close in the last game with 246 but Christyn replied with a 215 to clinch the victory 22 pins ahead of the Singapore youth. Local favorite, Ernie Cheng Hsing-Chao tied with Jin Lau of Singapore for third place with 2204, while another Singapore national youth, Benjamin Lim and Johnathan Chan rounded up top 5 with 2193 and 2185 respectively. "I'm so happy to win the Youth Open Masters," said the first year college student, who have also qualified for the Ladies' Open Masters. "I must thank my coaches Holloway and Allan Cheah for helping me to achieve this success. I hope I'll continue to do well tomorrow in the Women’s Open Masters tomorrow. "I knew Christyn will do well here since her superb performance here on Day 1," said the delighted national chief coach, Holloway Cheah. "The lanes suit her so well that she did all her squads both in the youth and adult above par. I'm looking forward to see how she will perform tomorrow in the Ladies' Open division. Meanwhile, Sun Yun-Pao captured the Senior Masters title after The Taiwanese amassed a total of 1633 over 8-games from Wang Ching-Ming in second with 1619 and Singapore's Jack Wong third with 1609. 9th October, Taipei: As Typhoon Krosa barreled toward China over the weekend and missed Taiwan, Malaysia's Aaron Kong put in a stormy performance to top the Men's Open Masters qualifying table of the 9th Chinese Taipei International Open on Monday morning. Kong, the Doha Asian Games Trios gold medalist, who was denied his first title this year after an agonishing second in the San Marino Open, knocked down 1007 to become the first bowler to surpass the 1,000-mark in his 4-game qualifying round en-route to topping the Men's Open Masters leaderboard. Malaysian bowlers immediately made an impact in the championship as Zulmazran Zulkifli, Alex Liew, Singapore Open first runner-up, Daniel Lim and Adrian Ang all posted impressive scores of 918, 905 and 881 to take up third to fifth positions respectively. 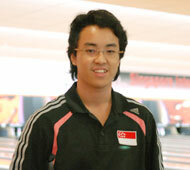 Early leader and Singapore youngster, Mark Wong settled for second with 971 posted yesterday. Kuo Huang-Chih of Chinese Taipei maintained his pole in the local pool with 944 with Chen Yung-Chuan and Cheng Hsing-Chao in second and third. While Geraldine Ng of Singapore remained on top of the Ladies' division with 964, Singapore Open Youth first runner-up, Christyn Chew of Malaysia stole the limelight when she qualified in the Youth division with 915 and subsequently also made the Ladies' Open division with another superb 919 to take up second spot. Singapore Open Masters first runner-up, Sharon Koh also did well to finish third with 898 ahead of Hong Kong's Chan Shuk Han and Cookie Lee making up the top 5 with 877 and 870. The lead in the Youth division went to national youth, Rodson Tong scoring an impressive 945 followed by Christyn Chew in second with 915 and pushing down Singapore's Gregory Gan into third spot on 901. Qualifying will end tomorrow (October 11) and the first block Open Masters finals will be staged on October 12 with the second block the following day. The top 6 will make the cut for the stepladder finals. 8th October, Taipei: Singapore's Geraldine Ng and Mark Wong took pole position of the Ladies' and Men's Open Masters qualifying table of the 9th Chinese Taipei International Open underway at Great World Bowling Center in Taichung. Ng amassed a 4-game total of 964 for an impressive 241 average for the lead in the ladies' overseas pool and as well as the overall leader. 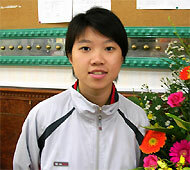 ABF Tour Hong Kong leg semifinalsit, Cookie Lee of Hong Kong finished second with 870. Indonesia Open champion and first runner-up of the ABF Tour Hong Kong leg, Bernice Lim displayed her consistency to take up third spot with 867 with Macau's pair of Alexandra Foo and Filomena Kit rounding up the top 5 in the overseas pool. In the local front, Chen Kuan-Ting of Chinese Taipei, topped the table with 892 followed by Wang Ting-Wen in second and Li Hsiao-Ping third with 859 and 850 respectively. Chien Hsiu-Lan is the ladies' defending champion. Singapore bowlers stole the early limelight as Mark Wong posted a superb 971 to take the lead in the men's open division. Wong, who shot a perfect game during the Youth Masters finals of the Singapore Open last week, only managed a 9th-place finish and will be hoping to do well this time round. Macau bowlers, who were the earliest overseas participants, occupied the next four positions with Luis Silva in second on 839, Van Ka Ki third with 833, Cheng Peng Seng fourth with 815 and Choi Io Fai fifth with 808. Kuo Huang-Chih of Chinese Taipei topped the local pool with an impressive 944 followed by Chen Yung-Chuan second 936 and Cheng Hsing-Chao third with 918. Ku Ching-Ho is the men's defending champion. Qualifying continues through to October 11 and the top 32 ladies and the top 38 men together with the defending champions will contest their first block Masters finals on October 12 at 1.30pm and 6.00pm respectively. Photos by B.C. Cheah and Terence Yaw.